Kaplan was fervently devoted to Professors World Peace Academy and organized three groundbreaking international conferences related to world social systems. All these conferences were organized into about 12 committees with 90 expert scholars presenting papers. PWPA leaders from about 90 countries around the world participated and learned about different systems of governance and how they might advise their own countries. Several volumes of books were produced from each of these conferences. The first was “The Fall of the Soviet Empire,” held in Geneva, Switzerland in August 1985, six years before the system collapsed. 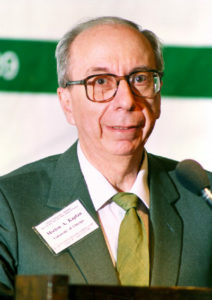 For this conference, he selected Professor Alexander Shtromas, a former communist legal scholar trained at the University of Moscow, and emigrated to England in 1972. One member of the CIA who had attended privately, later said he believed that this conference not only accurately predicted the collapse of the system but helped outline ways that the collapse and transition to a new system could be peaceful. The second was “China in a New Era,” held in Manila, the Philippines, in August 1987. For this conference, he worked with Professor Ilpyong Kim, an Asian Studies scholar trained at Columbia University. This conference showed how China, under the leadership of Deng Xiao Ping, while keeping the Communist Party in control, abandoned central economic planning in favor of a better understanding of “the forces of production” and markets. The third was on the future of Liberal Democratic Societies in a post-communist world. This was held in London, England in August 1989. Kaplan chose Professor Edward Shils professor at Cambridge University and head of the Institute for Social Thought at the University of Chicago to help him organize this meeting. Kaplan was also a senior advisor to International Journal on World Peace, a chairman of the International Conference on the Unity of the Sciences, and Editor and Chief of the World and I, a large (hundreds of pages) colorful monthly magazine published by the Washington Times. He also served several years on the University of Bridgeport Board of Trustees, promoting the education of students as world citizens. Dr. Kaplan, whom I worked under twice — first at ICUS and then at The World & I. What a powerful mind he displayed with unity in the founders of PWPA and ICUS. I also worked with Dr. Kaplan at the World & I. His monthly visits were exciting times to lay our thoughts for topics for the coming months in front of him. I was an editor in the Current Issues section of the magazine. May he Rest In Peace! Dr. Kaplan was kind as well as brilliant. He was a pioneer his entire life and brought love and understanding is everything he was involved in. It was my privilege to work closely with Dr. Kaplan for many years at the World & I. He was not only a brilliant scholar but a man of the highest ethics and integrity, always committed to what was right, regardless of personal consequences. He was a true “mensch” and will be missed by those who knew him. Dr. Kaplan was a visionary guide for The World & I magazine (and other associations. )As I Worked as both the Editorial Research Director and Managing Librarian I experienced with The World & I staff his continuing perspective as both traditional and innovative. Thank You so Much Beloved Dr. Kaplan! !